One of my favorite days at the gym is when I dedicate my workout to glute training. To make it clear, this is booty work day! It never fails to make me feel empowered, yet exhausted at the same time. I love having a strong lower body, because that’s where I have always needed my athletic abilities from. Let’s be honest, I need a strong backside to walk up Jeff and Morton Hill every day to get to my classes. For those who don’t know me well, I played volleyball all throughout high school and on national teams as the libero or defensive specialist. I needed to be quick on my feet and low to the court. My movements on the court powered from my lower body (plus core). Having built glutes was a necessity. Volleyball lifting and conditioning was a major part of being a high school athlete. I had a coach telling me what lifts to do and how many reps for each set to perform at all times. In the weight room, our lower body lifting was structured with parallel squats, power clean, box squat etc. Once my volleyball days were over, I quit doing these lifts. I began to coach myself and became interested in all things fitness. 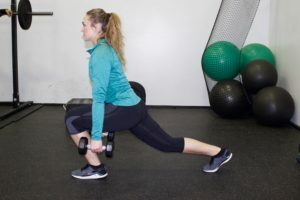 Naturally, I familiarized myself with glute training knowledge from fitness magazines, such as Oxygen, and from women in the professional fitness industry. Dedicating a couple days a week to strengthening your glutes will be rewarding! You may leave the gym feeling sore and tired with these moves below, but the shapely and toned backside will be worth it. I hope these exercises are a switch from what you may already be doing, or will spark your interest to start training your backside with purpose. All of these are moves that I incorporate into my glute/leg day at the gym, but sometimes I switch it up so I don’t become bored with the same exercises each time. Many of these serve as building blocks to alternative glute exercises you can do. Some variations allow you to even do these without equipment, depending on your location for exercise. 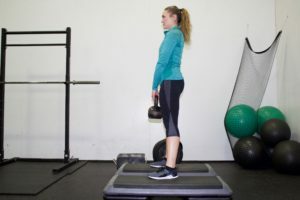 TIP #1 – For all exercises, balance your weight through your heels. This will take weight off your quads, so your glutes will be more engaged and grow! It may take some concentration to get used to, but when done right, you’ll feel the burn in your bum. TIP #2 –When you come up from a squat, direct your hips/pelvis forward and squeeze your glutes. The more you activate that muscle, the greater the growth and power into the glutes. *I do 10-15 reps depending on the weight I decide to use. For instance, the lower the weight I’m using, the more reps I’m doing with that lower weight. 1.Weighted Walking Lunges with Kickback – You can do this with or without weights. Weights overtime will add more ‘umph to your glutes, though. Sometimes, I like to do this one without weight on the bike path or even in a stationary position in my room. 2. 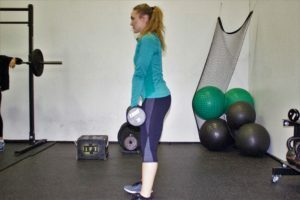 Kettlebell One-Legged Deadlift – This will allow you to concentrate on one side at a time, making it clearer if you feel the burn in your glutes or not. If you can’t find a kettlebell with the proper weight you need, use a dumbbell instead. 3. Elevated Squat with Dumbbell or Kettlebell – The lower you go, the better! The elevation allows you to bring the weight lower than your feet, which allows more room for your glutes to engage. Remember to focus your weight on your heels and to keep your back straight. 4. 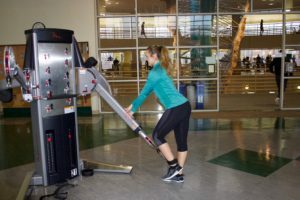 Weighted Glute Kickback on Cable Machine – Hook the ankle strap onto the cable machine and then wrap the ankle strap around the base of you lower leg. Face the weight stack and slowly kick back the working leg while contracting the glute. 5. Hip Thrust with Weighted Plate – At a steady pace, push the weighted plate upwards, pressing your upper back into the platform and pushing your hips upwards by flexing your glutes. 6. Stiff-Legged Kettlebell Deadlift – You can also use a pair of dumbbells for this as well. Keep your back straight and focus on powering your weight through your heels. 7. Walking Squat – For me, this one is a game changer. It will exhaust you, but I can’t find another exercise to mimic what this does! It combines slight cardio with weight training, getting your heart rate up and burning fat. Three Reasons Why It’s OK To Not Have Your Life Together In Your Twenties.